Just south of Twizel is Omarama, the gliding capital of New Zealand. Wrinkly Rams is a local café and also offers an informative sheep shearing demonstration. The Lindis Pass is one of New Zealand’s highest roads with the summit reaching 971 metres. The tussock covered hills offer an unusual contrast as you pass from the Mackenzie Basin and into Central Otago. Bendigo, just off the main highway, was one of Otago’s original gold mining settlements and well marked paths will guide you to explore the remains of stone cottages and other buildings from this bygone era. Cromwell sits at the head of the Kawarau Gorge. Cromwell old town has restored buildings from before the valley was flooded to create Lake Dunstan for the hydro systems. The sheer cliffs of the Kawarau Gorge guide you towards Queenstown and the Gibbston Valley is one of New Zealand's premier wine growing regions. At the famous historic Kawarau Bridge you can take a bungy jump or just watch others if you would rather. Approaching Queenstown the impressive Remarkables mountain range come into view and then beautiful Lake Wakatipu as you head then head south. The lake guides you into Southland and its rich farming pastures and into Te Anau, the gateway to Fiordland National Park. The gateway to the Fiordland National Park, Te Anau sits on the shores of the 345 square kilometre Lake Te Anau which reaches depths of 417 metres. Te Anau Township is the starting point for many walking tracks including two of New Zealand's Great Walks, the Milford track and the Kepler track. 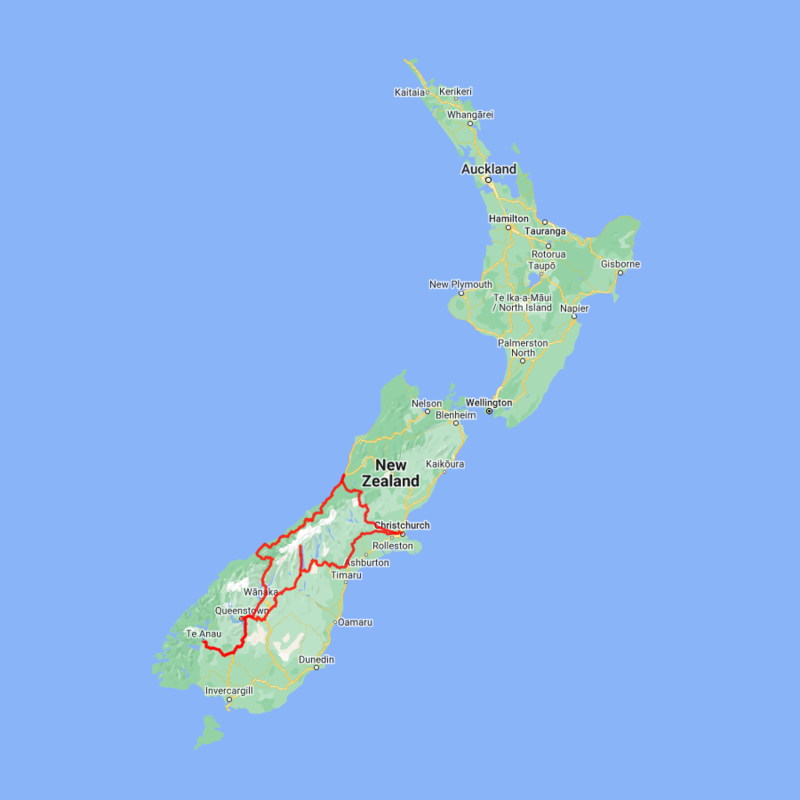 The Milford road originates here and this is arguably one of the most scenic stretches of highway in the country. This breathtaking 'Fiordland On Film - Ata Whenua' will take you on an unforgettable journey through one of the most awe-inspiring landscapes on earth. Shot by award-winning cinematographers with outstanding musical composition, this is the next best thing to a scenic flight over this spectacular wilderness. The drive north from Franz Josef takes you through the historic gold mining region of Ross and the town of Hokitika, a great place to explore the craft stores, in particular the jade or greenstone. The largest town on the West Coast, Greymouth is also the starting point for the Tranz Alpine Scenic Train. Greymouth sits on the Grey River almost at the western end of State Highway 73. It's the largest town on the coast and as such is the commercial centre. A fine small town centre with some interesting buildings makes it a pleasant place to stroll or if you are feeling a little more adventurous then there is almost every activity you can think of available here. The Wild West Adventure Company can take you glow worm caving, 4 wheel driving, white water rafting, horse back riding, riverboat cruising, bush walking, camping and relaxing in hot pools. In the centre of town you will also find the Monteith's brewery and a tour is highly worthwhile. Just to the south is Shantytown, a replica of a working goldmine village with reconstructed buildings, mine workings and a wonderful collection of steam trains. State Highway 73 is the main road between the West Coast and Christchurch and the scenery is spectacular - even in the rain! - and there is pretty good chance of rain in the high alpine mountains. With hundreds of waterfalls cascading down the bush clad hillsides it's not a road to be rushed. Lakes Pearson and Grasmere are also along this highway. The Otira Gorge on the Western side of Arthur's Pass features a remarkable piece of engineering with the road passing high on a viaduct through the large valley. There are numerous lookout points giving great views of the valleys. Watch out for the local residents - the kea is the worlds only alpine parrot and can be extremely cheeky. The small town of Otira has a rather unusual story with the sale of the Otira Hotel. The new owners upon completion of the sale were surprised to learn that they had purchased almost the entire town. To the east the road travels across the flat Canterbury plains through the towns of Springfield Sheffield and Darfield. There are no less than 5 ski fields along this highway.